Charles Rather than thinking about go, on which I'm really not an expert, I find myself thinking very often about go in the West, on which I think I'm in possession of a higher proportion of the important facts. In that context, SL and the way that many different aspects of go are laid out here - mostly by players from Europe and North America, but of course not entirely - provides a great deal of food for thought. I come up with the articulation problem, for go knowledge. First, though, some background. There were some serious European go players 50 years ago, and the scene in the USA was moving by then; in my country serious go (i.e. players 2 kyu and better, by current EGF rating) dates back 40 years. Initially there was simply a comprehension problem. I have talked to a veteran 1 dan from the early days of British go, who reckoned he never really 'got' the game. No immediate solution to that one; there were few books, and the go magazines in English or German were patchy in their technical coverage. What came next was noticeable as a transfer to an information problem, most obvious in the case of joseki. Top-level European games from the late 1960s show a lot of use of complex joseki, certainly in the hope that the opponent can be trapped or at least be given a substandard local result. (This attitude persists, but is now more common at a 1/2 dan EGF level, and it is much clearer why it can hold players back.) Fighting was wild, with not much of a feel for direction of play; reading was relatively good for things like capturing races. Some of the strong players realized that the way to win was to understand the endgame, in the sense that it was 'playing for money'. I'm not sure how long this went on; I didn't play much in the 1980s, and there was a gradual shift in favour of playing the Chinese opening or sanrensei and getting a favourable middlegame. Information on how to counter those was still scarce, absent reputable fuseki books and databases. I feel that period is also over; and the prevalence of online go means that there is plenty of easy access to what advanced strategies look like. Not pretty, a lot of it, though. I feel the articulation problem is still with us, though. Here on SL there are solutions on offer, none of them dominant. There is use of Japanese terms. Players who can read Japanese have an edge, I feel; though it is not necessarily any easier to learn the required amount of Japanese. Let me hazard a guess that an EGF 3 dan with knowledge of the Japanese literature would be an EGF 4 dan. On the other hand I think that the cultural factor is more like two stones (could even be more in South Korea). That is, a European 4 dan who had been brought up in Japan could with the same effort have been 6 dan, and so on for other dan ranks (yes, I believe EGF 6 dans, of which there are not so many, could have been on talent middle-ranked pros). The point I'm leading up to is that there is something else, and we are not going to pin it down by translating everything mentally into Japanese, and then back. Probably because we can't do the translation back, yet. In any case, this accounts for some of my considerable frustration at discussions here. I want to bypass Japanese terms entirely, because using English language carefully is going to be the answer. Much of the translated literature is just rather careless, and it is not going to improve matters to have more of the same (that was how the information problem was tackled, initially, but that is fighting two wars ago, on my theory). I'm phrasing it this way, rather than saying 'well, you have to start before age 10 to become strong', because (a) it's depressing to say that, and (b) young players need good coaching, in English if that's what they speak. My hopes for SL have included a good shake-out of the way go is discussed. They haven't come to fruition, looked at in the large, though I believe there is much here that is useful. I'm now not going to have the time to edit SL in a radical way (which I think would be the right way to go, after 10000 pages). Just to illustrate: we don't seem to be able to discuss a simple proverb like 'block on the wider side', without having to row back and wonder what an extension is. This seems a long way from having foundational concepts clear. There are a lot of people out there who you'll never get to stop using Japanese terms because a) they explain things to look intelligent, rather than to educate, and the Japanese terms make their explanations more esoteric, and therefore make them (in their own mind) appear more knowledgeable; and/or b) foreign words always sound cooler than ones from one's own language. DrStraw: There is an alternative reason. I learned to play from the very early Ishi Press books, which are full of Japanese terms. I really do think in Japanese terms and it does not seem natural to say "attach and extend" when I mean "tsuke-nobi". I realize that others may find the former more natural and the latter obscure, but I use the term because that is what first comes to mind. I will admit that there are some things which do come to me in English, and those I use. For example, I never think of sangentakabasami, even though I recognize it when I see it . For that the English phrase is more natural. There are some terms which are definitely more comprehensible in English. There is absolutely no good reason to say "tsuke-nobi" when you mean "attach and extend," for instance, since the latter is infinitely more comprehensible to an English-speaker. For other concepts, though, like "sabaki," though, does calling it "fancy footwork" really make it any more understandable to someone encountering the idea for the first time? Moreover, does a Japanese beginner have an easier time understanding sabaki than a Western one? Still, allowing some Japanese terms and not others creates confusion, since different people have different ideas about what should be translated into English and what should be left in Japanese. Deciding that everything should be in English solves that problem. I think the progression from middle game to endgame to opening is a common one. I'd even go so far as to say that that's probably the order in which most players learn to play the game. Rakshasa: All of this assumes the person learning the game has a good understanding of english. And it might be more natural for non-native english speakers to use Japanese terms as importing technical terms is more common. Besides, "sabaki" is not burdened by any non-go related associations. Knowing that it roughly means "development", I'm free to build my understanding of the concept. Bill: About language, I think that a mix is fine. For instance, in chess we talk about kings and queens, but the rook is not a bird. We say, Zugzwang, not strangulation, or something. Zwischenzug could be translated as in-between move, but who bothers? We say, Mate in three, not Kill in three. In go, we have extension for both hiraki and nobi, despite the possible ambiguity. But why invent terms for hane and tesuji? You sometimes used to see check for atari, but that has disappeared, thank goodness. I think that a lot of the problem is conceptual. As Charles says, the foundational concepts are not that clear in the Western go community. (Not that they are that clear to Oriental amateurs, either.) If you have access to Oriental literature, in Chinese, Korean, or Japanese, you can find really in depth discussions of those terms and concepts. The same goes for Western terms, like sector line and temperature. The best material for understanding these is in English. If you invent an English term that is not supposed to be a translation of an Oriental go term, but similar, where are you? The best understanding of that term is probably that of a high dan player. Good, but not the best. And you may get confusion between that and the Oriental term. Witness the confusion oven damezumari and shortage of liberties here. The resolution of the problem, I think, lies with the increasing number of go professionals who live in the West, teach in the West, and write books in Western languages. Their writings and teachings will provide the conceptual clarity and depth that we need. Bob McGuigan: Charles mentioned the depressing quality of the idea that to be really strong at go you have to start as a child. I think there is more to the idea of starting young than just the problem of transfer of information. In the USA there are some pros who have taught young people in go schools. I'm thinking of Feng Yun 9p particularly, but Yang Yilun has done this too. The children in these schools get strong very fast. One of Feng Yun's students is 9d on KGS for example. These children are too young to acquire information the way adults do. Doesn't that mean that articulation and compact expression are not necessary to learn go? At the Kitani dojo, according to Kato 9p, Kitani didn't actively teach his pupils. He just created the proper environment for learning and the pupils learned. I think this phenomenon is related to the way children learn foreign languages. They just soak it up when immersed. Adults can learn this way but don't seem to do as well. The necessary brain plasticity seems not to be there. Adult foreign language learners seem to want grammar books and rules rather than just jumping into an immersion environment and speaking. As for the Asian culture factor Charles mentioned, could some of that just be being present in a society where there is a vastly higher percentage of go, wei-chi, or baduk players and where it is a widely recognized and accepted activity? I'll bet we might see as many westerners reaching pro strength if the go population percentage in the West were as high as in the three main go cultures in Asia. SL and the go servers are as close as we westerners can come right now to the sort of immersion that exists in China, Korea, and Japan. John F. Charles's analysis looks broadly correct to me, and valuable. But I fear he is ahead of his time, and is liable to be frustrated. Maybe it's because I've had the benefit of talking to him live and seeing his contributions in British forums, but I have a sense that much of the response to him above has missed his main point. In particular, there is a danger of degenerating back into linguistic quibbles. Arguments over terms here seem to generate more heat than light, and I've given up on them. I believe that part of what Charles would like to see is a climate in which we in the west can all talk to each other about go theory in such a way that we all understand each other. Whether we do that in English, Japanese or Japlish is immaterial. We are far from that state. The question is how do we get there. I have a hunch that Charles believed SL could provide an answer, but he has been disappointed. If I'm right, I'd say that a major reason has been the linguistic quibbling. In fact, even though it seems to be on-topic in a major way, it's more pernicious and damaging than the KGS drivel here. I don't know the answer, and I don't get involved with teaching in the way that Charles does, so maybe I lack the right feel for the problem. But I've thought about it, and one result was the kind of work I illustrated (perhaps too patchily) on the thickness page. To recap, this involved taking a term and, rather than defining it myself, simply providing a long list of contextual examples of the term as used in Japanese go books, then inviting live seminar groups to come up with their own definitions (or, if need be, simply a list of the important elements). I was outside these groups - I was not even a moderator, though I was on hand to answer questions. This seemed to work. The collective view (around 14 people here) was usually consensual. Since everyone has access to the same information, they can all go back to the reference data if they discover they do have differences. I suspect that some people thought that this was how SL might have worked. Sadly it didn't. Probably we do need the face-to-face element. And we need group talk, not bilaterals masquerading as discussion groups. Charles makes a valuable point here, but I have one problem with it. I guess this has been discussed before, but is translating everything in english really useful internationally? I am a non english speaker, and the Japanese terms allow me to communicate with Korean and Polish players on a basic level. Would they understand what a bend is or corner enclosure? When i speak with French speaking players, i use some of the translated french go terms. The point I want to make is this: not everyone understands english. You could try to make english the new standard in go, but why? English terms are as alien for a Russian as the Japanese terms. When I am speaking to Dutch people who sometimes use translated go terms, I don't understand immediately -even if this is my mother tongue- what they are talking about. I think that the Japanese terms have one big advantage, they are relatively international. maybe this will change as go gets more popular in the west. Bob: I appreciate John's clarifying of Charles's remarks and I agree that not having a common vocabulary is a serious impediment to discussion. To bring up another point I'd like to ask what happens in the non-Japanese Asian go cultures. Clearly the Chinese have their own go (wei-chi) vocabulary and the Koreans their baduk terms. These weren't borrowed from Japanese, as far as I know. There existed a culture of go playing and the terminology grew along with the go culture. There was no case of a terminology being developed and then a culture established. Also, the concepts came first, then the terms for describing them. Maybe our problem in the West is that as a go culture we don't collectively have enough concepts to have a well-defined vocabulary. Our go concepts are acquired from other cultures for the most part so we have a hodge-podge hybrid vocabulary. Another problem, which must be responsible for the linguistic quibbling on SL, is lack of understanding the underlying go concepts. Players who don't understand, say, thickness very well are not in a position to discuss how to describe it. And new ideas, like haengma from Korea, need to be understood before we can decide on an English word or phrase for them. Because of this I think it is inevitable that foreign terms will end up being used in the West, at least until concepts become part of the common understanding. John's seminar groups came to an understanding of a concept and then decided how to talk about it. To Hicham: I think few of us have any difficulty in using Japanese words in place of English, and no-one seems to be trying imperialistically to impose any one language. The problems are of a different nature. One is that many people use Japanese terms wrongly (tesuji and nakade are good examples but there are many more). Many people use them correctly. So true communication is difficult already. What we've seen on SL is that attempts to educate people into using the term consistently in one way or the other don't get very far. Another is that many English speakers disagree even on English terms. Peep/peek/poke is a well-known example. We currently have another example here on SL - a disagreement over time/timing (PS Bob Myers is right - as usual). A third problem, which people like Charles tried to address on SL, but apparently without much success, is that where disagreements or misunderstandings exist, there is nowhere to turn to get a definitive answer. If we want to move forward, we need to overcome these problems. Maybe the third problem above could be solved by a much higher standard of editing on SL. But given how much work that takes, and the amount of opposition it generates, that doesn't seem a likely outcome. I'm proposing that a better way forward might be to reverse the old process of building on terms as a way of understanding concepts. Instead, let us see if we can get the concept over first and let the terms flow naturally from that. I don't know yet if that process really works. But it does seem to offer one potential benefit: concepts are large objects. Large objects are probably more able to withstand maltreatment than individual words. They are big enough and robust enough to stand as reference points. I think there is an excellent example of this already. It is my experience that the concept of aji is very well understood in the west, and it makes no difference whether you call it aji or potential or aftertaste or Gefurtel. Furthermore, it makes no real difference whether or not you know that the concept also embraces variants such as aya, te ga aru, etc. If you are strong enough you can apply these nuances without changing the overall structure. It would be interesting to know why the transfer of the concept of aji from Japan to the west worked, yet the transfer of moyo and sabaki only almost worked, and the transfer of thickness failed abysmally. To answer the point about differences in China and Korea. You need to remember that Japan occupied both countries for a long time and has strongly influenced their go vocabularies. Also, all these countries share the heritage of characters, which (a) makes transfer of terms easier and (b) means they also share the heritage of the classics such as Guanzipu/Gwanjabo/Kanzufu. It's not quite a uniform go culture, but is not far from it beneath the surface. Charles Having seen a number of replies - if that's the right word - here's a response as it took me last night. The emphasis on vocabulary now strikes me as terribly twentieth-century, in a way. Whether the close-reading version, or the idea that one looks at a whole vocabulary and tries to get a feel for its rootedness: what could be more standard, in academic terms? This is how university-educated people tend to think, given their education. I'm attracted by an idea that cuts across this. 'Articulation' is too narrowly defined, if it excludes the dojo approach. Sure, Kitani pupils didn't sit being lectured by sensei; they did get their daily tsumego, so no question they knew what lesson was today's. So, we see what happens when one tries to assault go knowledge from the verbal side, and on the large scale. I think there have been some enduring pieces of clarification posted on SL. On the other hand, no question in my mind that the BQM format works better. The ambition is much more limited, but some sort of lesson can be extracted even from the kind of query about gash variations from Kogo that we get. So, putting it baldly, I feel the way forward is through particularity. This sends one back to the vexed question of 'piecemeal' stuff in the Asian literature, versus Western wishes to have meaty general theory. Well, perhaps this is a cyclic thing, and going round the cycle can help if there is accretion both linguistic and of specific 'bits of go' tagged with their 'point'. But not constrained by the literature in Japanese, please. Bill: Thanks to Charles for clarifying how he meant, articulation. I am glad to see that he did not just have verbal articulation of go knowledge in mind. I agree that particularity is important. For some time I have been posting examples and exceptions from go literature. Thanks to John for his insights, too. On one point I am not as pessimistic. It is not always the case that there is nowhere to turn for definitive answers. Even in English, The Go Player's Almanac is a good reference, for instance. Not that it is perfect, OC, or always up to date. I have a suggestion as to why the concept of thickness has not been well understood in the West. Many years ago, the New Year's issue of one of the Japanese go magazines (Kido, I think), included bits of advice from every Japanese professional. The most frequent advice was, "Play thickly." The reason for that advice, I think, was that Japanese amateurs do not understand thickness, either. If they did, they would play more thickly. And if they played more thickly, they would come to understand thickness better. That's true for us, too. Charles The grass is greener in East Asia - no question. What I'm saying about articulation makes that largely moot, I think. All this discourse about pros (who vary greatly in their ability to express themselves on paper), lists of go terms (largely a solution to the information problem side, as was I putting it), and so on. I just look at thickness example 1 here; and consider what a cut-price job the go translators have done over the years. Why this matters to me, is that go may be the only strategy game of its type with the potential for broad appeal to adult learners. I think the climate has already turned against traditional games in general. A few are going to survive as sports; not too many. Go needs the selling point that it has a literature that is well-written. Bill: I just took another look at Thickness Example 1. I also took a quick look at my reference books. It's joseki, all right, but I don't see anybody calling Black's position thick in that material. That's why I draw examples from the literature. Even if I think I understand some go concept pretty well, my opinion as an amateur is not worth much. Better not make up my own examples. Looking at all the thickness example pages, I think I should dig up a few more which a pro calls thick. John F. That example is certainly not thick but it is a good example of how SL can be a bad thing. Not only is it wrong but there is no attribution or source. I think Charles is right that translators have sometimes bred confusion, but at least they will almost certainly have used the word thick for a word of similar meaning in Japanese. And at a pinch there is a source other people can go back to. There is some link with reality. In contrast, the example here has no link with reality and no health warning. For those who are unsure, the attributes of thickness are being solid, having no weak points, not being open to attack. A group with a wall facing the centre (which many people wrongly believe is an attribute) may be thick, or may not be. It often is, simply because being in the centre is a good way of avoiding immediate attack. Both strong and weak centre groups usually have influence. But neither centredness nor influence are essential attributes of being thick. Indeed, because these groups, even when classifiable as thick (because they are not open to attack), are often not really solid, they are usually described by the word atsumi (thick-ish-ness) rather than atsusa (thick-ness). Pros who say they have a thick style are those who make solid moves, not those who make centre walls like Takemiya. Sorry if that's gone off track a little, but there's method in the madness. It has been said that a good way of studying (proper) thickness is to look at games between Ota Yuzo and Sakaguchi Sentoku. Yuzo had major trouble playing against Sentoku's thick style. But if you look at their games you will not see many outside walls made by Sentoku. I wonder therefore whether it might be an idea to look at one of their games as a BQM. It may be a way of drawing together several strands in this discussion. One "lesson", in Charles's sense, we may learn is why Yuzo often failed to cope with this style. We may also shed some light on thickness terms. I've got a good example game, and I have a longish pro commentary on it, which we can use to haul us back in if we drift. If anybody wants to pursue this, I'll supply the game and keep an eye on the comments, but someone else will have to do the presentational work. kokiri - if the grass is greener in east asia, I don't believe that it's because the written material is any better than that in the west. There may be much more, but the best go books in english are as good as pretty much any of the japanese go books i possess and tempting though it is to believe it, I don't think that any of them contain the 'answers'. A more established tradition of teaching go makes it easier to have one's study directed and, faced with no obvious levers to pull to improve at go, directing one's study is hard, i think. If you don't know what will have effects, then putting work into things that can take work is a natural response, and I think this explains the temptation to become a joseki maven, or obsessive introspection into semantics. John F. Kokiri should be beaten round the head with kokiriko for saying Asian books are no better than the best western books. But I admit they have their (big) share of potboilers, and I do agree with the rest of what he says. I have a feeling that many of my generation have had to "suffer" from a lack of opportunities to play and so we spent our time, perhaps a little too introspectively, in reading books. Since there were few books then, those that existed had a disproportionate effect which has permeated through to younger generations. Some of that effect was based on errors (of fact, taste or judgement) and I think that explains Robert's point below: I agree solid could be better, though in practice I think it was preempted for honte. Robert Pauli: The problem seems to be (too) close translation. After what I read here, very interesting BTW, "thick" should be replaced with "solid" ("thickly" with "solidly", etc.). But whatever terminology, first comes the example: agree, Charles. Bill: There is not much dan level material in the West, I think, and even though there are many more dan players here than a generation ago, I wonder how much of a market there is for it. BramGo: I enjoy japanese terms a lot. The power of a japanese term is the same as the power of a proverb, they come to my mind whenever I need them. Imho there are only 3 reasons why we perform bad compared to japan, korea, china. These reasons are (1) We do not have as much players. Only a small amount of players has the talent to become a high ranked dan player. And I think that small amount of talented persons we have, might not even know what go is. In In Europe even more than USA I assume, Go still lacks a lot of popularity. (2) Even if we had more players, you can not expect that a person starting at the age of 16 becomes a high ranked pro player. At that age one does not learn as fast anymore as a 7 year old. (3) Mmmmaybe, we need a strong generation to guide us and to look up to. But what is the importance of a word really? Even if a player doesn't know the difference in meaning between the words "thick" and "heavy", everybody has to learn the difference on his own anyway. These are concepts you can not explain in words alone. Basics you have to discover yourself. And language is irrelevant here. 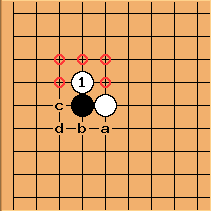 As for more advanced topics like fuseki and joseki, you only need diagrams. There are even people, who buy korean joseki dictionaries, only to look at the diagrams. Dieter: How about an analogy here? I find there is a striking lack of literature, videos, TV programs, websites ... about soccer. Soccer is tremendously poupular in Europe and while there are some media publishing guidelines how to play, I do not know one single player who became good through a formal study of the game. People just play, go to clubs, have coaches and this from the age of 5 on. I am in my thirties and play at the lowest possible competitive level. We recruit players who have played all their life and during the match they will shout stuff using come up with terms that they don't seem able and explain well. I wouldn't even know how to translate them. There is a big articulation problem in soccer. So, the lack of formal study of a popular passtime is not something typically oriental. The solution: more players, more coaches, more playING. Add to that colloquial modes of American and British English (at least), and there will be linguistic problems. There probably is a subset of 'International English' that is more generally used; like 'International Cuisine' it buys its acceptability by being bland. A rather limited vocabulary is indeed suitable for discussing problems and solutions. My impression is that this works fine here. It is less suitable for discussions of strategy - in that case it is hard enough for native speakers to make themselves understood to other native speakers. Anyway, I don't think this can be policed on a wiki. Strange expressions should probably be edited down by the 'clean-up crew' doing a first copy-edit. For myself, I don't like smileys and Internet abbreviations in long-term text. Of course some people are more used to that kind of communication than literary English. RBerenguel: I'm not sure if I got the basic idea of this page, but I see it similar to the problem we face in mathematics, when we aren't speaking in english. A lot of terms don't have a direct translation, or a direct short translation, and anyway, the english term 'hits', because we learned them that way. Yesterday I was thinking about 'convex hull' and the direct and self-explanatory 'envolvent convexa' (in catalan). To me, they both are the same, but when I read them, I don't grasp directly the catalan version, and don't know why. It's like aji, I 'know' what aji is, but can't define it precisely. Like this, there are a lot of other terms (polynomial-like is the most striking to me). I see it as a quite purely language problem. When I'm reading an english/german/french/maybe catalan or spanish text, I just get the meaning, but not an individual meaning. If someone comes and asks me: hey, what does the word X mean in that you are reading, there are a lot of times I can't translate it precisely, giving only a vague reference to the phrase it's on. I try to look at go (and maths, by the way) the same way. I don't know what thickness is, or aji, or hane (just as example, I know what it means...). But when playing or looking at a game... it is 'what it is'. Maybe the best definitions are very short, with a lot of examples? Karl Knechtel: I don't know what thickness is, or aji, or hane (just as example, I know what it means...) Strange you should say that. While teaching beginners, I've found that so far, one of the most difficult questions they've set me (in terms of "how do I explain it for their level") is "what's a hane?" A hane is , circled spots empty, letters anything, no? Anon It is a mistake to believe that access to knowledge or the knowledge itself is really holding back the level of play in the 'West'. There are several factors, not starting to play at a young enough age. Not consistently facing high level opposition. Not possessing a framework to develop or train players. Not possessing a strong enough motivation or incentive to reach a higher level. Western players are deemed strong at opening, weak at fighting (middlegame) Yose not sure. Fighting strength comes from practice and experience. Of course, it would be nice if people would stop pedantic arguments on linguistics too.